Despite the madcap appearances, it could really have been called in advance. Well, in a broad sense anyway if not in the specifics. 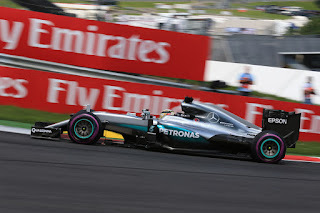 Mercedes was meant to dominate at Austria's Red Bull Ring this weekend; really rationally it should have done. But this is a track where, in time-honoured tradition, things are rarely that simple. They weren't that simple for today's qualifying hour. On reflection, they were indeed much less simple even than that. Some of the what-it-is-about these Spielberg visits can be explained: it's a short lap made up essentially of seven turns which ensures a tight grid, as does that this track, in its layout and altitude, isn't too sensitive to downforce which the normal pace-setters tend to have more of. The tight turns at the end of long straights draw plenty of errors. Sudden arrivals of rain are known here, and one of those before vital Q3 added plenty to today's fun. Yet even with these some matters simply are intangible, almost like there is something - other than precipitation or altitude that is - in the local air. Today's also was a qualifying session that had much of its strangeness set beforehand. 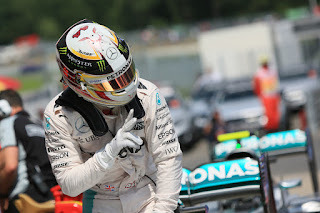 It is ironic that Lewis Hamilton in the previous day or two here was bemoaning his luck, and specifically on the subject of grid penalties. On his fifth MGU-H and turbo for the year already, starting drops later in the year seem inevitable and this makes his task of overhauling the points gap to his Mercedes team mate Nico Rosberg even greater than it would be anyway. It didn't help in a more immediate sense that in Friday's running he was by his own admission "way off the pace," and he "just didn't feel great" at a track that hasn't been happy for him since F1 returned in 2014. Nico - unbeaten here in that time - meanwhile looked imperious. Well as the song goes, what a difference a day makes. In the course of the next 24 hours he got a sizeable proportion of the disadvantage he described back, as both of his two closest nominal rivals picked up their own grid drops, of five places each. 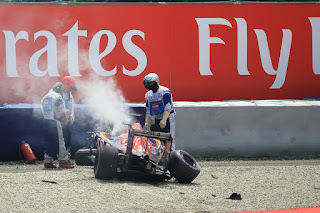 First off and as had been anticipated Sebastian Vettel was condemned to add five to wherever he ended up in the quali order, after a fault in his gearbox discovered after the last round necessitated a change. Then that self-same Rosberg got exactly the same penalty, in his case a consequence of binning his Merc accelerating out of turn 2 in Saturday morning practice, and the damage meaning his own gearbox needed changed ahead of time. Rosberg's accident was the result of a rear suspension wishbone failure, and many thought they knew the cause. Yet even before this morning's sharp deviation from the script there was another conspicuous spanner kicking around the pristine Mercedes works. Graining, which they seemed to be experiencing more than any other, after just a handful of laps on the ultrasoft tyre that presumably they would qualify and start the race on - Lewis even suggested he was struggling to keep the car on the track as a consequence. Even now the possibility remains of an extra early stop tomorrow on a day that most will aim to stop just once. Race day is expected to be cooler than today too and such conditions have been associated with graining lately. Adding to the silver worry the Ferrari for one looks to be much more benign on the rubber. But as for qualifying pole was - in net terms at least - Lewis's to lose. In the end he didn't lose it, but boy was it far from routine getting there. In Q2 the Mercs' race day likely got trickier still when both Ferraris and Red Bulls got through with their best time set on the more durable supersoft compound, meaning they'll start on them tomorrow. Merc tried belatedly to do the same, but the beginnings of the rain mentioned meant they had to abandon the plan. Thus began Q3 on a streaming surface, all on intermediate tyres, but matters soon conformed to the James Hunt truism that F1 tracks always dry quicker than you think. 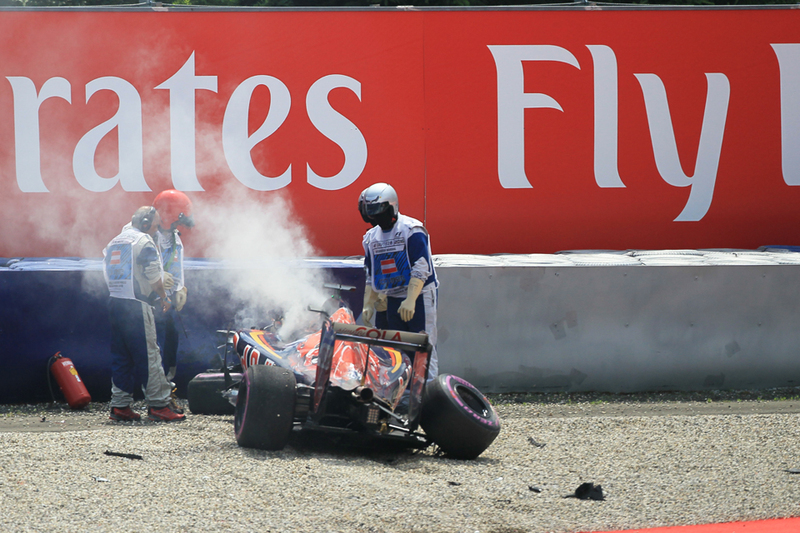 As it started Vettel was heard saying on his radio that there was "no chance" for dries. Even as cars started to peel in to change with around four minutes left Rosberg reckoned it was well too soon. But not so. The water steamed off the tarmac almost before our eyes and in sharp contrast to before in a blink slicks were the thing to have. As ever in such conditions the name at the top of the times was ever-changing - Hamilton, Rosberg, Vettel, Kimi Raikkonen, Daniel Ricciardo, Felipe Massa all were there, sometimes more than once, though always briefly, as who set the time last with the driest track was the chief discriminator. 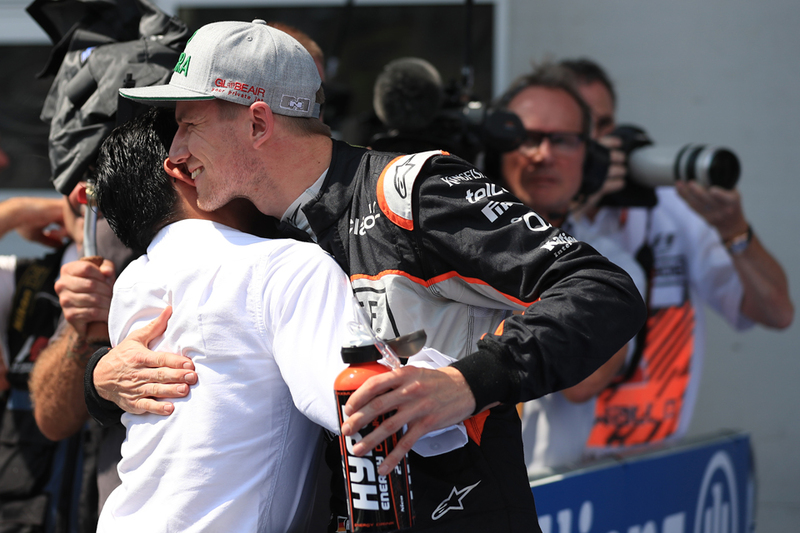 But demonstrating that not everything this weekend is a matter of voodoo, as we know from experience the man to watch when such challenges are faced is Nico Hulkenberg. He is at the brave end of brave and his aggressive style seems to scrub in the tyres quicker than most. Remember Brazil's qualifying in 2010 when he seemed to be on a drier track than anyone else? We got pretty much the same today and as the clock ticked down it looked like just as in Interlagos pole could be his; his every mark established over the line swiping great chunks off the previous best. In the end though with the track near enough dry - the pole mark was only 1.7 seconds over the ultimate dry time - normal order was restored in large part as the Mercs took the top two places. Hulk had to make do with third, but one that will become second on the grid after his namesake Rosberg's penalty. "It reminded me a lot about Brazil", said the Hulk of his showing, "and I was feeling really good in the car and it was just a flashback to back then. I was feeling really good and to be honest, I was expecting a little bit better. "[But] I wasn't disappointed. A great effort from the team. Not an easy session to be out there at the right time, it's all about timings. The car performed well, we put it together, so a very solid job and a very good starting position for tomorrow". Another man to watch in such situations is of course Jenson Button, and he didn't disappoint either. His delicate style allied to being last over the line - always important on a drying track - added up to P5 in the order, which will will become P3 for tomorrow's grid formation. F1 did rather step through the looking glass today. 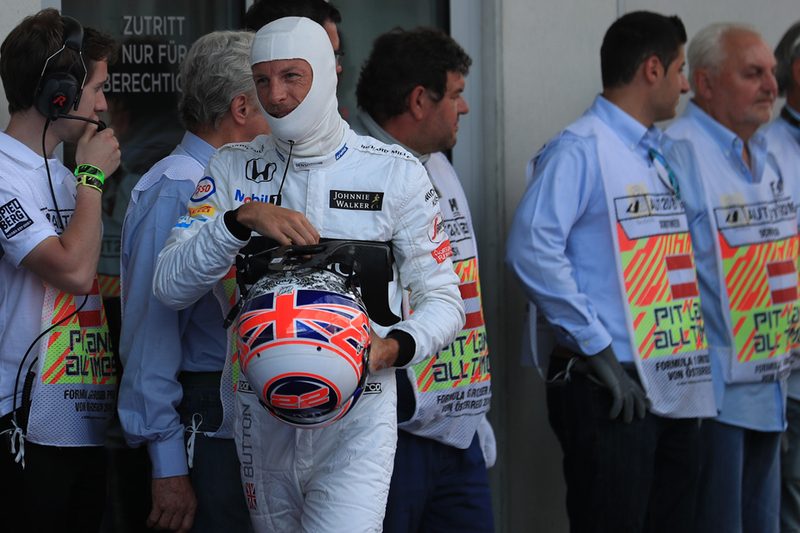 "I love those conditions", said the elated Jenson afterwards, "can't have we that every race! "That's mega. It was an enjoyable session...On the wets we were quick, and on the dries we weren't too bad either." He was similarly jovial about his chances in the race. "It's easy from here isn't it? I've seen it on TV, when they're at the front they just disappear!" As for his stable mate, a combination of a team error putting him out on used tyres in Q2, then yellow flags then rain - which he called "primary school mistakes" afterwards - meant he starts a disgruntled P14. His only crumb of comfort is that in previous years at this circuit some have got good results from employing a contrary strategy starting outside the top ten on harder tyres. There was another unusual, elevated outcome today, and one that owed nothing to the weather. 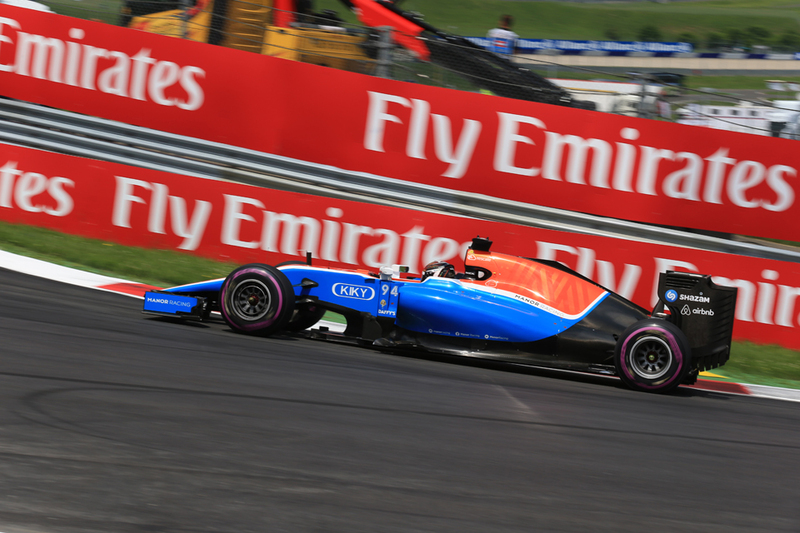 Pascal Wehrlein in the Manor will start tomorrow in P12. The track as mentioned rewards power and does not punish less good aero as much as most and therefore suits the Manor Mercedes, and of course it'll be a familiar track to Wehrlein what with his DTM experience. But still it is an achievement not at all to be sniffed at. 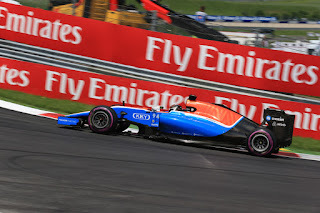 It equals Marussia/Manor's best ever starting slot (matching Jules Bianchi in Silverstone 2014) and it was only the second time one of its cars has got into Q2 in dry conditions. It's also the team's highest slot without precipitation's help. 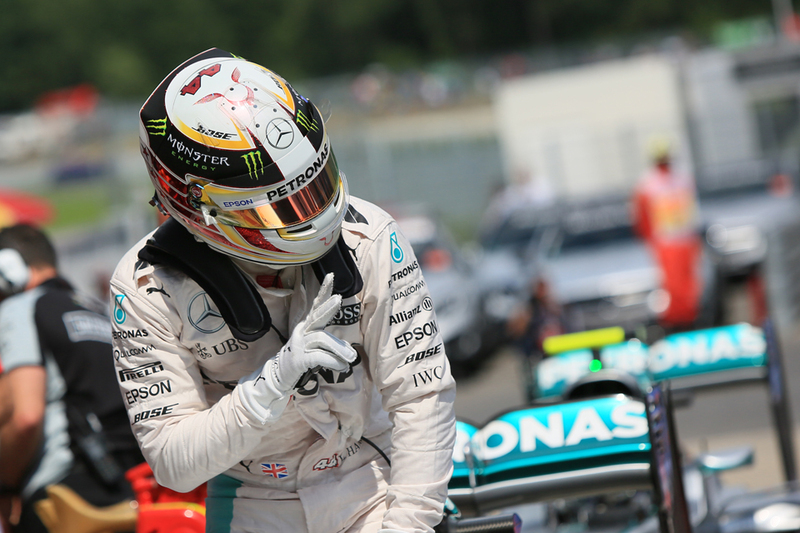 But ultimately, and while it was easy to miss with everything else going on, it was Lewis's day. In the end he didn't need the luck he'd got beforehand, and while there is rarely a shortage of those seeking to question his modus operandi, two things of his cannot be questioned, and came in useful today - his bravery and his ability to improvise. His final mark was some half a second better than Rosberg's, a full 1.3 seconds better than Hulkenberg's and near enough two seconds better than Vettel's, whose P4 for the reasons said becomes a P9 start. "Yeah, it was a really fun session" said a contented Lewis afterwards. "It was one of those sessions that it starts off dry, goes wet, and quite incredibly here it dries up so quickly, it's like driving through fog at some stages. I think it just added to the excitement of the whole thing. I'd never driven here in the rain before and being a new surface as well it was very, very slippery. "It was drying up corner by corner and at the end it was about getting that last lap. The previous lap was a good lap as well but if I had finished that lap I would have been right behind Daniel Ricciardo, so I backed off, which was a big risk really. If I didn't finish my lap or there had been a yellow flag I wouldn't have been able to get pole, but it was the risk I took and fortunately it paid off, so very happy with it". Tomorrow's race will not be simple for poleman Lewis either, mainly for the reasons given regarding the delicate Pirelli rubber and the Mercs' damaging impact on it. "I think the ultrasoft is not a good tyre for the race" Lewis admitted. "It's going to be a struggle to get a lot of laps out of it so the strategy will be interesting tomorrow. As for his rivals, not all that far behind, starting on the supersoft? "That's not a bad thing [for them]" Lewis also admitted. "Obviously those guys are starting behind me so I'm hoping I have a bit of an advantage at the start just from being on the softer tyre but...yeah, in practice my tyre lasted for four laps, so I think for Nico [Rosberg] it lasted maybe eight? He says five. So it'll definitely be tricky but we'll do the best we can with it." But really with so much rain-related disruption so far much is unknown for the tyres - as the sage Jenson added, tomorrow "nobody knows what the tyres will do". Much is unknown on most other matters as well. All in, we have Hamilton looking good on pole but perhaps with an early stop required, the likes of Vettel and Rosberg presumably coming through the pack and plenty of cars in unusual positions. And you can add to all of this too that we're in Austria. Make sure you're in place for this one.